The Russian space program has been in disarray for many years, suffering numerous launch and spacecraft failures since 2009-2010 - mostly due to mind-numbing poor quality control or mission planning, and often corruption. Dating from the breakup of the Soviet Union, it's depended on funding from international collaborations (ISS module construction & launches, crew transit seats, Apollo-Soyuz etc) and US rocket engine sales (since the 1990's) to keep their lights on and stopping their engineers from going to Iran, North Korea etc. Also funding from satellite launches, but now SpaceX, India and China have taken most of Russia's former share of that market - SpaceX alone splitting the bulk of major new launch contracts with Arianespace. Its been a tough run for them, and the Russian government has only recently started to re-fund important parts of their program. Roscosmos is dead, hail Roscosmos! MOSCOW, December 29. /TASS/. Russia’s Federal Space Corporation Roscosmos has given up most of its lunar projects but this won’t affect scientific exploration of the Moon, Deputy Director of the Space Research Institute at the Russian Academy of Sciences Oleg Korablyov told TASS on Tuesday. "Roscosmos has given up most of piloted projects for the Moon. What is important is that the federal space program for 2016-2025 has retained automated programs for the exploration of the Earth’s satellite. That is why, the decision to give up most of piloted programs won’t affect the Moon exploration," Korablyov said. Russian scientists plan to implement five automated programs for the exploration of the Earth’s satellite as part of the 2016-2025 state program, he added. "Most space researches can be carried out in the outer space with the use of automated vehicles. In particular, we plan to explore the Earth’s satellite with the help of the Luna-25 landing probe. Then we plan to launch the Luna-26 orbital spacecraft and the improved Luna-27 polar probe that will bring lunar soil to the Earth, after which we’ll launch a lunar surface vehicle. As you see, all the automated projects will be implemented," Korablyov said. Next year, work will be continued to prepare the first three spacecraft for their launch to the Moon, he said. "The launch of the first Luna space vehicle is planned for 2018," the scientist said. MOSCOW, December 30. /TASS/. Russia has begun the work on the creation of a super-heavy space rocket, its first step will be the Fenix rocket, Deputy Prime Minister Dmitry Rogozin said in an interview with the Rossiya-24 TV channel. "In fact, the work on the new space program has been started, I tell you this as some serious news on the super-heavy rocket," the deputy prime minister said. The official said that if the Angara rocket is like a jeep capable of taking to orbit 7 tons of payload in the light variant and up to 37 tons — in the heavy variant, then for major expeditions it is necessary to have a "dump truck." "The super-heavy rocket will be such "dump truck", but we are getting down to its creation like the Soviet Union had embarked on such project — first it created the Zenit rocket that was the first stage of the super-heavy rocket Energia, and only after that additional modules were created for such unique rocket," he said. "We are now creating it on a totally new technology basis, and the creation of the Fenix rocket, which will become the first stage of the super-heavy rocket, is envisaged in the new federal space program. Rogozin added that the payload capacity of this rocket will exceed 100 tons, and maybe even 150 tons. On Tuesday, a source in the space rocket industry said that plans for creating a new generation space rocket Fenix remained on the agenda of the Russian space agency Roscosmos and had been included in the draft of the federal space programme for 2016-2025 despite certain cuts in budget financing. "Research and development under the Fenix project has been preserved in the draft of the federal space programme, which is undergoing inter-departmental coordination. True, the possibility of removing Fenix from the programme was discussed at a certain point, but for now this promising project has remained relevant," the source said. Fenix is part and parcel of a product research and development portfolio, its eventual aim being creation of a new space rocket for manned programmes. The Zenit-size rocket may be built according to a modular principle and consist of several modules. A super-heavy configuration is a possibility. 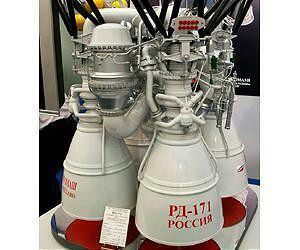 The RD-171 engine from NPO Energomash, already used in the Zenit rocket, is regarded as a potential first stage. The previous federal space program draft extending till 2025 envisages feasibility studies for developing a medium class space rocket during 2016-2017. 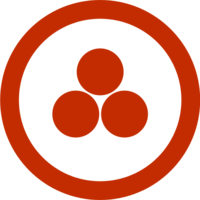 Research and development was due to begin as of 2018. Under the project Roscosmos in 2018 through 2025 was to spend more than 30 billion roubles ($430 million) for the purpose. According to earlier reports, the budget financing of the federal space programme would be slashed from 2.004 trillion to 1.4 trillion. MOSCOW. Dec 30 (Interfax-AVN) - Russia will develop a new super-heavy-lift launch vehicle similar to the Energia rocket for exploring deep space, Deputy Prime Minister Dmitry Rogozin said in an interview with the Rossiya 24 (VGTRK) television channel on Wednesday. "The new federal space program includes the development of a new space rocket, Fenix, to become the first stage for a super-heavy-lift launch vehicle. This is not 37 tonnes of Angara or 25 tonnes of Proton, but even 100 or, maybe, even 150 tonnes," he said. "Angara is sort of a 'jeep' to launch seven tonnes in its light modification and up to 37 tonnes in the heavy-lift one, yet we need a 'truck' for large-scale expeditions, and the super-heavy-lift rocket will be our 'truck'; we are starting it in approximately the same way the Soviet Union started its project in the past," the deputy prime minister said. The president insisted that Roscosmos progress in this field and the federal space program was optimized despite the need to save funds for the sake of accomplishing this project. MOSCOW, December 30. /TASS/. Russia’s Roscosmos State Corporation is looking for ways to minimize spending on spacecraft launches, and solutions are within reach, Deputy Prime Minister Dmitry Rogozin Rossiya 24 TV channel in an interview broadcast on Wednesday. "We are getting closer to new solutions," Rogozin who is responsible for the space industry in the Russian government said. "If we are asked what the main task in civil space is, we would say that it is not the Moon or Mars, the main task is cheap space. Our competitors are on our heels. We are looking for a solution that will allow making spacecraft launches cheaper. Of course, such solutions will be found," the deputy prime minister noted. 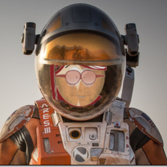 "Just recently the president signed a decree on abolishing the Federal Space Agency. That means that there will no longer be so much bureaucracy. Everything will now be part of a state corporation which will design new spacecraft and implement new projects by itself," Rogozin said. If Fenix is to be the S1, it sounds like they're talking a multi-core design. Perhaps akin to the UR-700 clustered S1 layout if they're going for 100-150 tonnes. UR-700 variants were planned for up to 175 tonnes, and it was the direct competitor for N1. They'd have better off chosing it instead. MOSCOW (Sputnik) — Russia's flight test commission has decided to complete testing Soyuz-2.1a and Soyuz-2.1b rockets and to hand the launch vehicles over for operation by the Defense Ministry and Russian state corporation Roscosmos, the defense ministry said in a press release on Wednesday. "Flight tests of Soyuz-2 1a and 1b launch vehicles are completed. The decision was taken by the State Commission for conducting flight tests of manned space complexes. The commission's meeting concluded that flight tests of the Souyz-2 1a and 1b launch vehicle versions have been positive, and the flight test program has been fully executed," the release said. The flight test commission has also decided to complete testing the Fregat booster produced by the Lavochkin Research and Production Association. Both the Fregat booster and the Soyuz rockets will be transferred to the defense ministry and Roscosmos for operation, the release added. The Soyuz-2 rockets were developed starting from 2006. The 1a variant includes a digital control system in place of its analog predecessor, as well as an improved booster and fuel injection systems. It was first tested in 2011 at the Guiana Space Center. MOSCOW (Sputnik) — "Now at ISS-Reshetnev’s facilities there are more than 30 satellites at various stages of production. The company has signed new contracts for the production of 16 more satellites," according to a statement on the company's website. Detailing results for 2015, ISS-Reshetnev said that eight satellites produced by the company had been launched into various orbits throughout the year, while another 12 satellites are currently waiting to be launched. A total of 96 ISS-Reshetnev satellites are orbiting the Earth, which makes up over two-thirds of Russia's orbital fleet, the statement noted. As part of its contribution to Russia's Federal Space Program, ISS-Reshetnev completed three security-oriented orbital constellations, the statement added. A total of five Russian space-based systems now operate via satellites built by the company. ISS-Reshetnev was founded in 1959 as part of Sergey Korolev’s OKB-1 Special Design Bureau of Research and Development Institute. Named after Korolev's close associate, Mikhail Reshetnev, the company started from supervising ballistic missile designs, and further started to develop launch vehicles and satellites. BLAGOVESHCHENSK, December 31. /TASS/. The construction workers of the Vostochny cosmordome that is being built in Russia’s Far East have decided to see the New Year in and continue the work without the New Year holidays - they will get down to work on January 2, the press service of the Dalspetsstroy company (under Russia’s Federal Special Construction Agency - Spetsstroy) told TASS on Thursday. "December 31 is a working day at the construction site, and on January 2 the employees will resume the work. 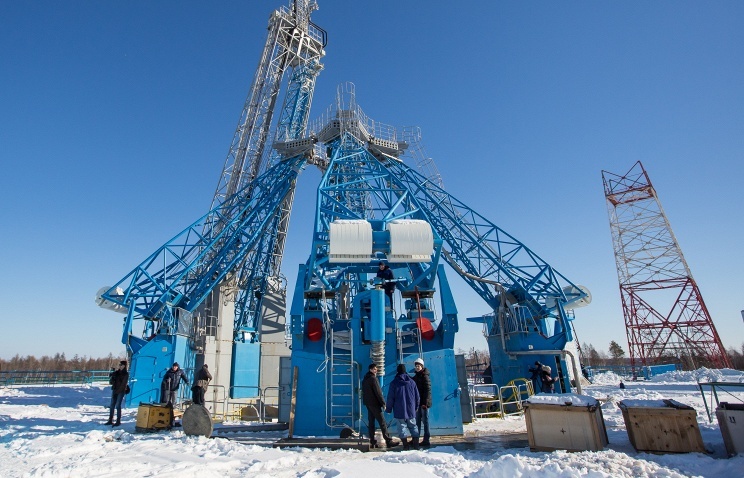 In addition, the duty schedule for the New Year holidays is ready at the cosmodrome that is under construction in the Amur region," the press service said. More than 4,600 employees and 815 pieces of equipment are currently engaged in the construction of the Vostochny spaceport. The work during the holidays is necessitated by the technological process peculiarity. "The construction site is a living organism, growing and developing regardless of the calendar date", the company said. Dalspetsstroy said that security measures will be stepped up at Vostochny during the holidays. Deputy heads of branches are on duty at the spaceport facilities during the day and night, emergency response teams are on constant alert. All the workers have been given additional instructions regarding their actions in the event of any emergency. 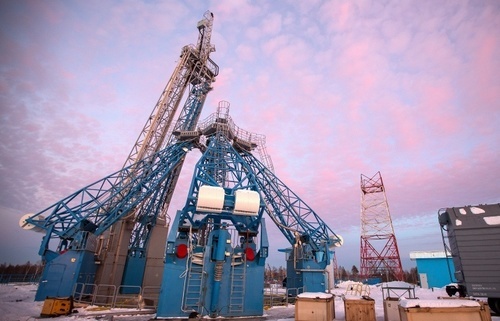 The Dalspetsstroy press service said that 2015 was a decisive year at the cosmodrome - "a huge breakthrough has been made in the construction and installation work." More than 10,000 construction workers and about 1,000 equipment units were engaged in the spaceport facilities during the "peak periods". About 1,400 students of teams from 27 regions of Russia have worked together with the cosmodrome builders. "Much has been done, the efforts have been praised by the country’s government, but it is necessary to keep going without stopping even for a day to fulfil all the tasks. A huge amount of work is carried out by the engineering and technical personnel in the preparation of the turnover documentation, which is needed for the commissioning of the facilities", Dalspetsstroy said. The Vostochny complex will include two launch facilities, an aerodrome, cosmonauts’ flight training facilities, an oxygen-nitrogen plant and hydrogen plant, 115 kilometres of automobile roads and 125 kilometres of railways and other facilities. Russian President Vladimir Putin said on December 17 he hoped the first launches from the Vostochny space center will be held in the first quarter of 2016, but warned that there is no need for excessive hurry. "I hope the first launches will be conducted in the period that we denoted - the first quarter of 2016. But there is no need for excessive hurry. The most important thing is that all should be done with due quality," Putin said at his annual news conference. He said Vostochny is "the largest project of national significance." "We are creating an entire city," he said. 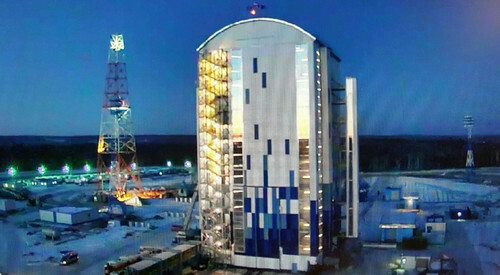 The Russian head of state recalled that there were schedule delays during the construction of the space center, but added that they have been reduced. "Delays were up to 1.5 years. Now we’ve cut them down to 5-6 months," Putin said. Construction of the Vostochny space center in Russia’s Far East started in 2012. The overall area of Vostochny is some 700 square kilometres. It will become the first national civilian-designation space centre and will make it possible to ensure full access of Russia to space and will reduce domestic space science’s dependence on the Baikonur Space Centre Russia leases from Kazakhstan. The first launch from the new space center was scheduled for December 25, 2015. Later it became known that the launch is delayed until 2016. MOSCOW, December 29. /TASS/. Russia’s Federal Antimonopoly Service (FAS) has initiated a case against three organizations suspected of anti-competitive collusion in the construction of the Vostochny spaceport, the ministry said. The regulator suspects that the federal state unitary enterprise Dalspetsstroy, the Federal Centre for pricing in construction and LLC Gosnormativ colluded when choosing a contractor to calculate individual indices of the project’s cost change. The cost of the contract amounted to more than 300 million rubles ($4.5 mln), the regulator said. "Such arrangements always lead to an increase in the cost of construction and, therefore, contradict the interests of the state," Deputy Head of the FAS Alexander Kanev said. In August 2015, the FAS found that the the Federal Centre for pricing in construction, Gosnormativ and several other government agencies violated the Law on Protection of Competition. Then the agency had revealed the signing an anti-competitive agreement, which resulted in or could lead to a restriction of competition on the market of software for calculation of construction costs. What's interesting about Vostochniy is that what we see from the pictures is just a tip of the ice-berg. It's going to be a whole city (of up to 100,000 residents) with many underground facilities. The planned total area is 551.5 km2, being a region approximately 30 km in diameter. More than 400 social, engineering and transport infrastructure facilities, 115 km (71 mi) of roads and 125 km (78 mi) of railroads are projected to be built at the cosmodrome. Yes, we have been following the progress very carefully. You will see satellite shots and artist's impressions on the first few pages of the thread. This complex is much smaller than Baikonur, but efficiently condensed for maximum utilization of resources. A complete town is being developed in stages (3), as well as an airport, gas plants, main rail station, multi-purpose processing facility for all launchers, training center and launch pads to eventually cover all models from satellite launchers to the super heavies. The best part is that this facility is non military and designated as a commercial space port, which includes access to all nationalities. Russia is aware of the changes required to stay competitive in this field, and are adapting. The system is being revamped, corruption is being addressed and budget reductions are ensuring maximum value is achieved. But the commercial side of their operation faces severe challenges. Reusable launchers from SpaceX, Blue Origin and others internationally, as well as smallsat launchers from Firefly, RocketLab and the air launch crowd will be tough competition. They can do it, but their quality control and rampant corruption issues must be fixed. They also have to deal with their poor supply of radiation hardened or radiation tolerant, or even modern, computers and avionics for their advanced aircraft and spacecraft, which has been a big problem. They want to have fabs ready in the 2020's, but that's still iffy. Agreed...They have to stop the "bleeding" from commercial launch contract losses....stabilize at a level and then try to increase commercial launches with competitive pricing...a very tall order. 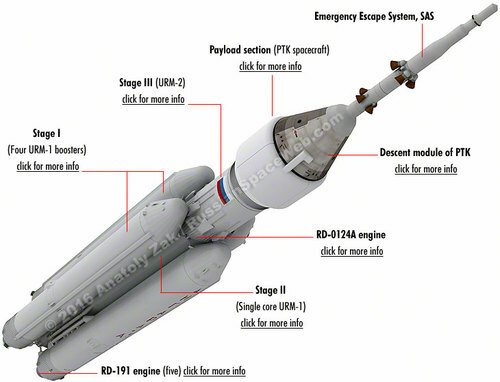 I would be happy just to see Soyuz and Angara launches developing. Russia's space-based ambitions aren't going anywhere, but Roscosmos, also known as the Federal Space Agency, will soon be no more. Earlier this week, Russian President Vladimir Putin signed a decree dissolving the agency. December 31, 2015, is its last day in existence. Starting January 1, Russia's space missions will be planned and executed by the Roscosmos State Corporation, a combination of the Federal Space Agency and United Rocket and Space Corporation -- an entity created in 2013 to renationalize Russa's space industry. The corporation will still be called Roscosmos. Exactly what will be different about the new configuration isn't entirely clear, but Russia's leaders apparently thought a reshuffling and a fresh start was necessary for a space agency that suffered a number of embarrassing rocket, cargo capsule and satellite failures, as well as allegations of corruption. Space officials in Russia hope the new consolidation will help diminish corruption and keep missions on schedule moving forward, but critics aren't so sure. "Russia, when it encounters a problem -- and Roscosmos, indeed, has got a lot of problems -- it always chooses a bureaucratic method and instead of one bureaucratic structure, they create another one, arranging a management shake-up," Alexander Golts, a defense analyst and deputy editor of Russian newspaper Ezhednevny Zhurnal, told VOA News. "But this shake-up only means a victory of one bureaucratic clan over the other. It doesn't mean that things in Roscosmos will improve." NASA and the American space companies it works worth also suffered a number of delays and failures this year. But a private American space industry has also enjoyed a number of promising innovations. Russia's space-faring ambitions will face stiff competition from Elon Musk's SpaceX, which recently demonstrated its reusable rocket technology. In January 2015, the Kremlin was finally fed up with the scandal and initiated a more radical reform. The governmentrestructured Roskosmos into a State Corporation, which unlike the agency, would combine the functions of policy making and strategic planning with business and economic activities. The entire rocket and space industry would be under control of the State Corporation. I wonder how this will affect Boeing, Lockheed-Martin & ULA's ability to buy RD-180's and Orbital's ability to buy RD-181's? Any changes to those sales or the availability of those engines? IMO, I think it has no effect, as the money will find a good home financing space ventures, which they will need to help with a reduced budget and slight vision change. I am just glad that Vostochny is a priority, as well as trying to be competitive. They can't beat SpaceX , but can try to some what remedy the situation to become stable for launch contracts. We need everyone viable to reduce the cost of space. I agree. They'd be shooting themselves in the foot if they interfere with those sales. They have a great money-maker with those engines, and (to the Russians) the 180's and the 181's are old technology -- and if the need arises they certainly have all of the designs and even some of the Engineers and Laborers to build more. Win-win. I'm not opposed to using Russian engines for US Rockets. What I'm opposed to is the backwards, deceptive way OldSpace went about blackmailing Congress into getting more of them. MOSCOW, December 19. /TASS/. Russia’s government has supported the suggestion from Amur region to name the city at the Vostochny cosmodrome in memory of outstanding scientist Konstantin Tsiolkovsky, the government’s website reported on Saturday. The bill reads the city in the Amur region, which will grow around the new Vostochny cosmodrome, will bear the name of Konstantin Tsiolkovsky. It would be "a worthy perpetuation of a great scientist Konstantin Tsiolkovsky," the website reads. 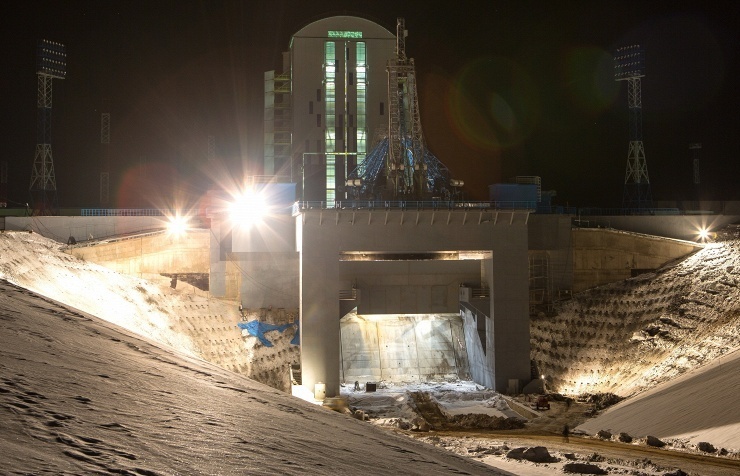 Construction of the Vostochny space centre in Russia’s Far East started in 2012. The overall area of Vostochny is some 700 square kilometres. It will become the first national civilian-designation space centre and will make it possible to ensure full access of Russia to space and will reduce domestic space science’s dependence on the Baikonur Space Centre Russia has been leasing from Kazakhstan. The first launch from the new space centre was scheduled for December 25, 2015. Later, the information was the launch is delayed to 2016. Konstantin Eduardovich Tsiolkovsky (Russian: Константи́н Эдуа́рдович Циолко́вский; IPA: [kənstɐnʲˈtʲin ɪdʊˈardəvʲɪtɕ tsɨɐlˈkofskʲɪj] ( listen); Polish: Konstanty Ciołkowski; 17 September [O.S. 5 September] 1857 – 19 September 1935) was a Russian and Soviet rocket scientist and pioneer of the astronautic theory, of Polish and Russian descent. Along with his followers, the German Hermann Oberth and the American Robert H. Goddard, he is considered to be one of the founding fathers of rocketry and astronautics. His works later inspired leading Soviet rocket engineers such as Sergei Korolev and Valentin Glushko and contributed to the success of the Soviet space program. Although many called his ideas impractical,:8,117 Tsiolkovsky influenced later rocket scientists throughout Europe, like Wernher von Braun. Russian search teams at Peenemünde found a German translation of a book by Tsiolkovsky of which "almost every page...was embellished by von Braun's comments and notes. ":27Leading Russian rocket-engine designer Valentin Glushko and rocket designer Sergey Korolyov studied Tsiolkovsky's works as youths,:6–7,333 and both sought to turn Tsiolkovsky's theories into reality. :3,166,182,187,205–206,208 In particular, Korolyov saw traveling to Mars as the more important priority,:208,333,337 until in 1964 he decided to compete with the American Project Apollo for the moon. MOSCOW, January 3. /TASS/. Russia’s Accounts Chamber will re-inspect construction of Vostochny spaceport in Russia’s Far East in 2016, its Chairperson Tatyana Golikova said in an interview aired by the Rossiya-24 TV news channel. "Of course, there will be (another) inspection. We should see what has changed and how the funds additionally allocated for construction of the spaceport has been used," Golikova said. Earlier the Accounts Chamber detected that the estimated cost of construction of certain sites of the spaceport was overestimated by 20%. 2014 inspection detected that Roskosmos (Russia’s space agency) committed financial violations worth 92.9 bln rubles ($1.2 bln) at Vostochny construction while federal budget regarding the construction was executed by 85.4% of the plan, or 139.8 bln rubles ($1.9 bln). First new district in Vostochny around January 2016. The actual construction of the new town in Vostochny started at the end of 2013, or four years behind original plans. Grandiose designs for a 40,000-person city were now split into a three-phase plan, postponing most of the construction until later. 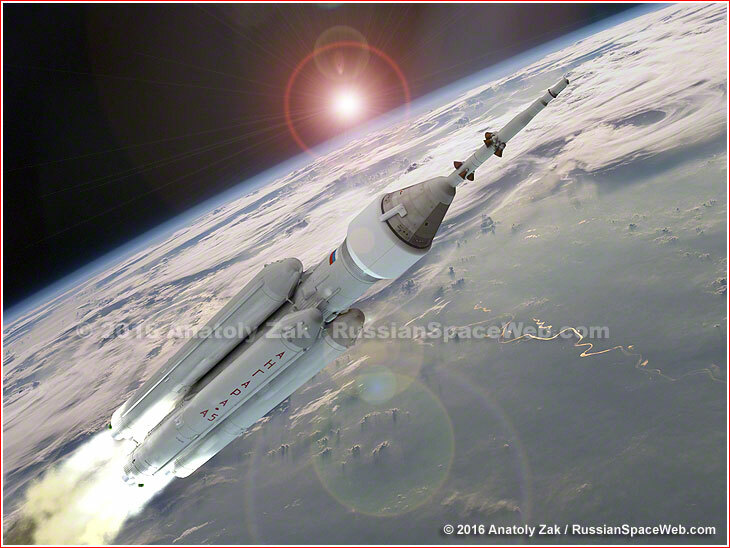 The population of the center was expected to grow along with the arrival of each new launch vehicle to the space center: Soyuz in the 2010s, Angara in the 2020s and the yet-to-be-named super heavy rocket in the 2030s. As of April 2013, the first phase of construction was to be completed by the end of 2015. The initial housing district was to include 24 buildings for 12,000 residents and social infrastructure. (678) This plan was also quickly scaled down to 17 buildings for 5,000 people. By the end of January 2014, Spetsstroi promised "soon" to complete 17 buildings, including 12 apartment blocks with 1,482 apartments, with the top floors being in process of construction. However due to the late arrival of construction documentation in October 2013, real construction could only start in November, Spetsstroi complained. Plans apparently continued to be scaled down in 2014, when the official certificate for the town projected the completion of 1,045 apartments for 3,500 people in December 2015. A kindergarten would accommodate 230 children and feature a swimming pool. The residential complex would also include an administrative building, a new hospital and a pediatric center. 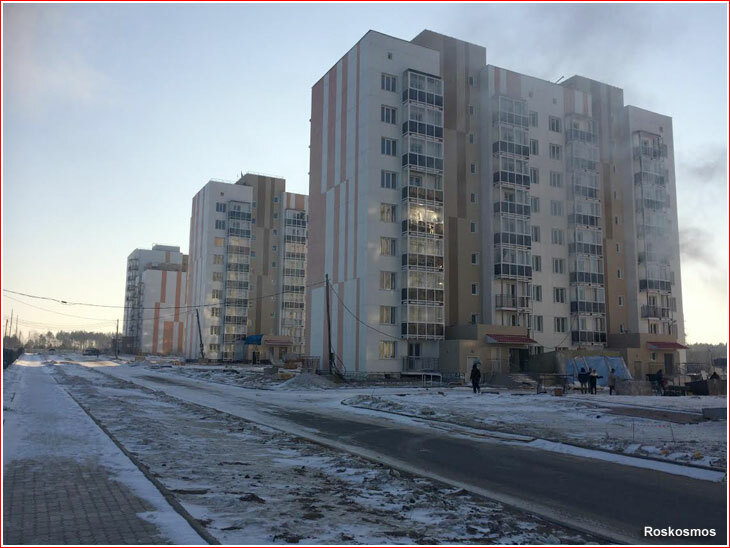 Finally, by April 2015, the first population of the new residential housing was quoted as 1,200 people, with the schedule to complete four buildings by July 1, five more by October 1 and three more by December 1. Probably responding to the lack of workforce, in April 2014, Russian officials announced plans to recruit student brigades for the construction of the residential area during summer months. During his visit to the site on Sept. 2, 2014, Russian President Vladimir Putin warned against the Soviet practice of building technical infrastructure at the expense of residential housing. In fact, that was exactly what was going on. According to Putin, during his helicopter tour he had seen only about eight new apartment blocks for 3.5 thousand residents under construction, while 40 had been promised for 12,000 people. A press-release from Spetsstroi issued at the same time said that three blocks with 228 apartments would be completed in 2014 and another nine buildings, a kindergarten and support infrastructure would be finished by June 2015. On January 15, 2016, Roskosmos announced that first residents had moved into two new 72-apartment blocks along the Gagarin street in the Zvezdny Gorodok (Starry Town) district. According to the agency, two more buildings were close to completion. The announcement stressed that the residential complex had already been linked by a new road, had had a functioning grocery store, an active bus line, while a kindergarten and an administrative building had still been under construction. The initial plan was to install a methane-powered engine on the new Feniks rocket. However, later the budget was adjusted and the idea was abandoned in favor of restoring the Zenit project, equipped with a modernized RD-171 engine. Russian federal agency Roscosmos plans to develop a natural-gas-powered rocket engine. The federal space exploration program for 2016-2025 guarantees funding for the project. According to newspaper reports, under a special R and D project on propulsion engines, Russia will develop the structural elements of an oxyhydrogen-powered rocket engine. Roscosmos is reported to be ready to unveil over 25 billion rubles ($326 million), however not the entire sum will be spent on a methane-powered engine. The project also includes developing prototypes of new-generation liquid-fueled rocker engines equipped with diagnostics and protection systems as well as structural elements from composite materials. "We plan to build a methane-powered engine prototype even though a rocket-carrier equipped with it is not in development so far. It would be a stepping stone for our future projects, and it would help us compete with foreign rivals. Currently, the plan is developing a medium-thrust engine for the second stage of a future rocket," a source close to the initiative told Russian newspaper Izvestia. As a whole, the project is an important part of Russia's efforts to create a low-cost, easy-to-maintain returnable rocket. The new booster could cut costs of space transportation thanks to its reliance on new engines powered by environmentally safe and widely available propellant made of cryogenically cooled natural gas (or methane) instead of traditional kerosene fuel. In Russia, research into methane propulsion was led by Chemical Automatics Design Bureau, based in the city of Voronezh, and began in 1995. It was established that the replacement of kerosene fuel with liquefied natural gas could produce a higher specific impulse, one of the key characteristic of a rocket engine. What is more, methane was estimated to cost up to 30 times less than kerosene. In addition, the development of a methane-powered propulsion system would not require any new major infrastructure or newly qualified personnel. Finally, liquid methane and its combustion products would be environmentally safer. Despite severe cuts in its space budget at the end of 2015, the Russian government gave the go ahead to the development of a new launcher family, which could finally replace the legendary Soyuz rockets after seven decades in service. Moreover, the new rocket is also positioned as a steppingstone toward the super-heavy booster to carry a next-generation manned spacecraft into deep space. Russian officials did not hide the fact that the latest move was prompted in part by the competition from the US-based SpaceX company. By 2015, Roskosmos put the price tag of the Soyuz-5 program at 30.79 billion rubles, which would be spent from 2018 to 2025 within the Feniks (Phoenix) development effort. The agency hoped to issue a technical assignment for the vehicle during 2016 or 2017. Along with Roskosmos, the Russian Ministry of Defense apparently also showed some level of interest in a Soyuz-5-type vehicle. In 2015, the Russian government promised a federal tender for the Feniks project. However at the end of 2015, the Soyuz-5 project tittered on the brink of cancellation, due to severe budget cuts in the draft of the Russian Federal Space Program, FKP-2025, which would allocate budgets from 2016 to 2025. Yet, living up to its new name, the Feniks project survived the latest budget slump even if in a streamlined shape. 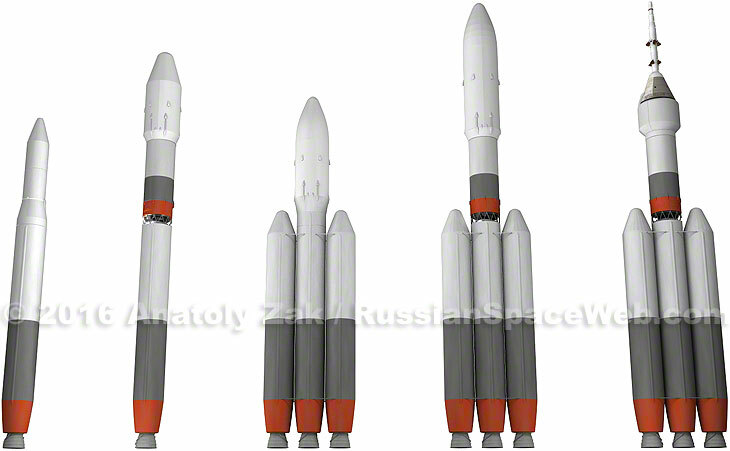 On December 30, 2015, Deputy Prime Minister Dmitry Rogozin said that the Feniks project would produce a successor to the Soyuz family of rockets and will also serve as the first stage of the super-heavy booster. "The president worked hard to prompt Roskosmos' move in this direction and despite cost savings, a way was found to optimize the budget to begin this project," Rogozin said. At the time, the Feniks concept was apparently still remained in a definition stage with solid rocket motors and even kerosene-fed RD-171 engines still on the table for a possible use in the future rocket. Though many years of R&D will be required, with an independent methane engine starting development as well, it is hoped that it will eventually replace the Angara. Reusability will also be a factor and I assume this design will change many times before finalizing. Initial launches of the PTK spaceraft would be conducted on the Angara-5P rocket. On August 26, Roskosmos announced a contest for a new name for the spacecraft, which included a public poll coducted from December 4 to December 23. The results approved by a jury chaired by the head of Roskosmos Igor Komarov were announced only on January 15, 2016. The new ship would be named Federatsiya, a Russian word for "federation." Referring to the political structure of the Russian state, the name continued a tradition of the Soyuz spacecraft, whose name meant "union," reflecting the official name of the Soviet state -- the Soviet Union. Runner-up names in the contest, such as Gagarin and Vektor, were reserved for future space projects, the agency's announcement said. The public reaction on social media was very mixed: critics noted that the name is long, phonetically unpleasant and has a good chance of being abbreviated to something unceremonious like "Fed." What was it? I must have totally missed it. The way that the video, above, is produced, when compared to the usual video's which have come out the last little while. Specifically the vehicle transit scenes, music selection and the console segment, is the way SpaceX has done all their promo video's. This is actually a compliment since SpaceX does create top notch video's on a consistent basis which also keep the public and fans informed. Roscosmos also has a fan base and need to keep them in the loop. This is a great way to portray new and exciting changes that are coming. So, what you are saying is that the Russians are copying the Americans - quite typical, yet can't be farther from the truth. I thought the video was a horrible one, a Soviet-style type with some modern CGI. So, what you are saying is that the Russians are copying the Americans - quite typical, yet can't be farther from the truth using modern PR practices. A bit Kerbal-ish, but a decent effort. No worse than the ULA launch progress animations. Nothing practice on the part of their video guys won't fix. The upper stage of a Soyuz rocket, and its payload of satellites, will be transported by air this week to the Vostochny Cosmodrome in Russia’s Far East, joining the lower stages of the Soyuz rocket previously shipped there. SAMARA, January 19. /TASS/. 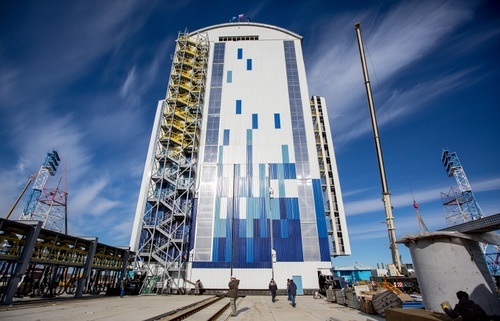 Preparations for comprehensive testing of the Soyuz-2.1a launch vehicle start at Russia’s Vostochny space center in the Far-Eastern Amur region on Tuesday, the Director General of the Progress launch-vehicle manufacturing company, Alexander Kirilin told reporters. The Volga booster block and the satellites due to be orbited in the framework of the first launch effort will be loaded on Tuesday into an Ilyushin-76 cargo jet in the city of Samara where the manufacturer is located. "This cargo is to be delivered to the space center on January 22 and unloaded the next day after arrival," Kirilin said. "Then the preparation of the booster block and the satellites [for the space mission — TASS] will begin. The Soyuz-2.1a was taken to Vostochny from Samara on September 24, 2015. Under the initial schedule, the first launch from the new space center was to take place in December 2015 but President Putin proposed to put it off to 2016. As part of the first launch effort, the carrier rocket is to take into orbit the Mikhailo Lomonosov satellite designed by students of Moscow Lomonosov State University, the first student nano-satellite SamSat-218 that was designed in the city of Samara, and the Aist-2D satellite for remote sounding of the Earth. The latter is a joint project of the Progress company and the Samara State Aerospace University where the equipment for the orientation of and control over the space probe, as well as the gauges for studying the impact of the outer spacer environment on the onboard equipment and materials were designed. SamSat-218 has the primary objective of working out the algorithms for control over nano-satellites. A special communications and control device installed aboard and connected to the GlobalStar mobile telephony system will be used for telephone calls aboard with the aid of a mobile terminal and getting the necessary telemetric information on the progress of the flight this way. Russia has detained a top engineer on its delayed Vostochny cosmodrome project on suspicion of accepting a bribe, investigators said Monday in the latest setback for the country's troubled space programme. The FSB security service arrested the engineer overseeing road construction materials at the site on suspicion of taking a 50,000-ruble ($632) bribe from contractors, the Investigative Committee of the far eastern Amur region where the project is located said in a statement. Russia is building the $4.8 billion cosmodrome at Vostochny, some 7,800 kilometres (4,846 miles) east of Moscow, to make its space programme independent of former Soviet neighbour Kazakhstan, where it currently rents the Baikonur cosmodrome used for trips to the International Space Station and satellite launches. The high-profile project, with a budget is estimated at 300 billion rubles ($3.8 billion at the current exchange rate ), has been beset with multiple corruption probes and complaints from workers that they have not been paid. Tatiana Golikova, the head of the national audit chamber, said last year that the total overspend at Vostochny exceeded 13 billion rubles. Investigators in the latest case said that the engineer received a bribe for ensuring that the contractor's building materials were accepted without any problems. The suspect was caught allegedly in the act of taking the bribe in a car. If charged and found guilty, the engineer faces up to six years in prison and would have to pay back six times the value of the bribe. Deputy Prime Minister Dmitry Rogozin, who oversees the space sector, responded to the engineer's detention on Twitter, saying: "We warned all of you: don't thieve." Russian President Vladimir Putin in a visit in October said it was realistic for the first unmanned launches to take place in spring 2016 rather than in December 2015 as planned. Manned flights are planned to start in 2025. The state company in charge of the construction, Spetsstroi has filed 31 cases over contractors, asking for compensation of more than 4 billion rubles. It has won 17 of the cases, resulting in a payback of 3.5 billion rubles, said Spetsstroi's deputy director Alexander Mordovets on Monday in an interview with RIA Novosti state news agency. The Russian Federal Space Agency has presented its ten-year development plan, which includes the construction of a prototype engine powered by atomic energy, able to power a spacecraft on expeditions into the far reaches of the galaxy. The Russian Federal Space Agency (Roscosmos) has presented its ten-year development plan to the Russian government, which includes the construction of a prototype engine that uses a nuclear reactor to propel it on expeditions into distant space. "All the work on the construction of the atomic engine is ongoing, in accordance with planned timescales. We can say with a large amount of certainty that the work will be completed within the provided timescale," Andrey Ivanov, a spokesman for Rosatom, Russia's State Atomic Energy Corporation, told Izvestiya. The project is part of the 2016-2025 Federal Space Program, which Roscosmos has recently presented to the Russian government for approval. Andrey Ionin of Russia's Tsiolkovskiy Cosmonautical Academy told Izvestiya that the program envisions a wider plan for space exploration, which will guide the direction of the engine's construction. "It is clear that an atomic engine is necessary only for exploration of distant space," said Ionin. "Projects like the creation of an atomic engine have to take place in the context of a larger project, in order to precisely understand what exactly we are making such a powerful energy source for." On Monday, Rosatom revealed that some aspects of the engine's construction are already underway. "Two important stages of the project have recently been carried out," said Ivanov. "Testing of the reactor's casing has been successfully completed. This testing subjected the casing to excessive pressure and took 3D measurements of the metal, welding and conical intersection." In addition, "A unique fuel element has been constructed which allows the engine to work in high temperatures, in large temperature gradients, and high doses of radiation," said Ivanov. Currently, space probes such as NASA's Voyager and Pioneer spacecraft use Radioisotope Thermoelectric Generators (RTG) to convert heat from radioactive plutonium-238 into useful electricity. These atomic batteries have been used since the 1960s to power long-term, unmanned, space missions to the dark, distant reaches of the solar system, or to the night side of planets where solar cells are not practical. When it was launched in 1977 Voyager 1's three RTG's produced about 470 watts of electric power, with the power output degrading over time. On January 18, 2016, a team of specialists from RKTs Progress, who are responsible for the assembly and testing of the Soyuz rocket in Baikonur, arrived at Russia's future space port in Vostochny to support the first launch campaign at the new site. 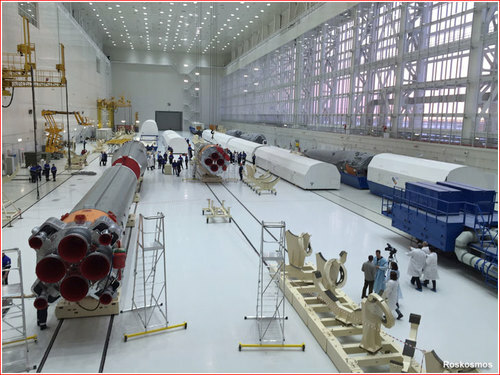 The Soyuz-2-1a rocket intended for the maiden flight from Vostochny was finally unloaded from its transport containers on January 20, after its assembly building at the center's processing facility had received power via a permanent supply line, Roskosmos announced. At the time, autonomous tests of the new launch facilities were scheduled to be completed by March 26, 2016, when the rocket would be rolled out to the launch pad for integrated tests. 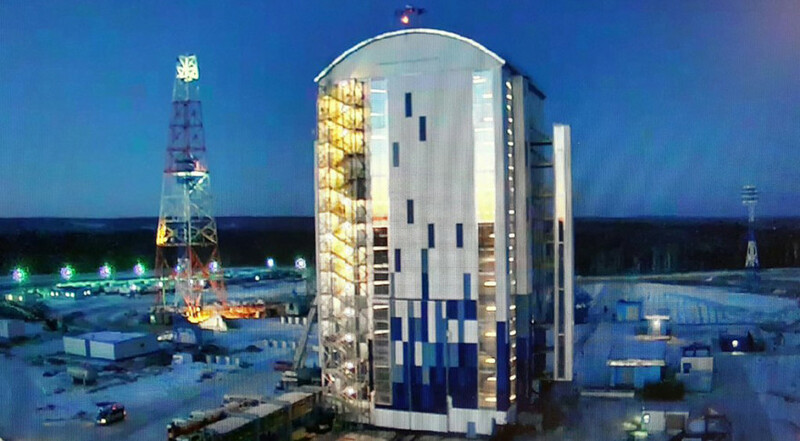 Contingent on the success of all tests, the first launch from the new Russian space center could take place as early as the second half of April, the head of Roskosmos Igor Komarov said upon his inspection of the site on January 20. Also on January 19, the Volga upper stage, the Aist-2D experimental remote-sensing satellite and the SamSat-218 educational nano-satellite were scheduled to depart the airfield at the Aviakor plant near the cirty of Samara onboard an Il-76 transport plane bound to Blagoveshensk, south of Vostochny. The hardware was expected to reach its future spaceport on January 22 and be delivered for processing a day later. The primary payload on the first flight from Vostochny -- the Lomonosov satellite -- was expected to arrive at the launch site on February 1. Russia's Roscosmos space agency is currently in talks with Tehran on the possible training of an Iranian astronaut for a space mission, Roscosmos General Director Igor Komarov said Wednesday. Komarov also said negotiations were also underway on launching a satellite for Iran. "I wouldn't say that there are any contracts signed, but on the other hand, I wouldn't say that interest has faded. We are currently on the stage of working on these issues. We're discussing the possibility of training [an Iranian] astronaut and constructing a satellite," Komarov told journalists at the Vostochny Cosmodrome currently under construction. Russian Deputy Prime Minister Dmitry Rogozin told Russian media in November 2015 that Moscow and Tehran had struck a deal to cooperate in space research. Iranian Vice President Sorena Sattar said in the summer that Iran was interested in running joint space projects with Russia. He lauded Russian space technology as being unparalleled and said Iran wanted to use Russian carrier rockets to put satellites into orbit. 1) They have some work done already on "fly back booster", but have appeared to temporarily suspend this. 4) Fenix was initially intended as a LNG modular lifter to overlap Angara, now..no LNG and modular with ability to up size to super heavy lifter. 5) LNG engine work to continue and a future lifter made to "fit this package"
7) Reduced budget for next 10 years and falling oil prices will not help matters. 8) PTK capsule to continue till completion. 9) Two overlapping launcher families preferable in case of an "accident"....assured access to space. If I had to guess, one of them, the Soyuz 5 or Fenix, may be curtailed shortly due to budget constraints. My guess would be to continue Fenix on the way to super heavy. 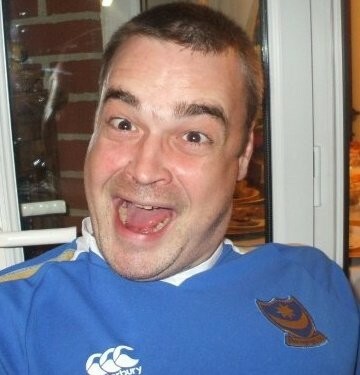 Well Doc...how bad have I botched this analysis....?